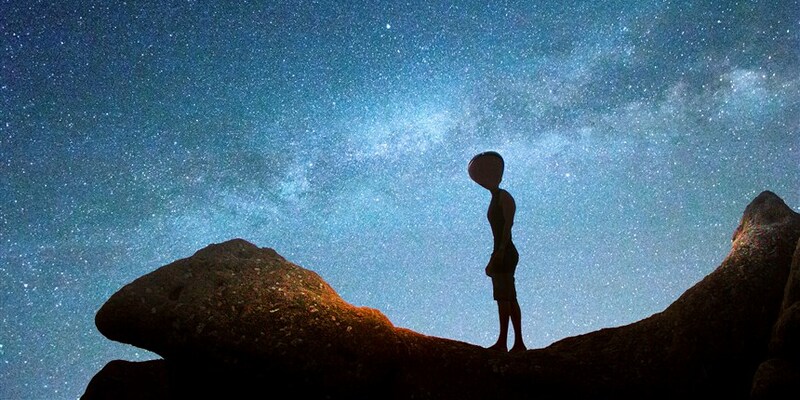 Home » Should We Be Looking for Space Aliens a Bit Closer to Home? We’re used to the idea of searching for space aliens by scanning the heavens for their radio signals — after all, that’s what Jodie Foster’s character does in the 1997 movie Contact and the way alien hunters commonly go about their work. But some scientists think the search for extraterrestrial intelligence (SETI) shouldn’t be limited to far-flung star systems. Rather, they argue, we should consider the possibility that evidence of intelligent aliens might exist here on Earth, or on one or more of our nearest neighbors in the solar system. These scientists aren’t saying aliens might be living among us now. They’re raising the possibility that another intelligent species lived or visited our cosmic neck of the woods millions or billions of years ago and left behind so-called “technosignatures” — things like radios, rockets, or other examples of advanced technology — that might yet exist deep underground or out in space. – Should We Be Looking for Space Aliens a Bit Closer to Home? “It occurred to me that the idea has all but vanished from the professional literature, and I wanted to point this out and ask to what degree it is gone because we have ruled it out,” Penn State astrophysicist Dr. Jason Wright told NBC News MACH in an email. “We need experts in a variety of fields across – Should We Be Looking for Space Aliens a Bit Closer to Home? astrobiology, geology, and anthropology to look at all the data to make concrete statements” about whether there’s a chance that advanced space aliens once lived or visited here. Wright, who outlined his provocative argument in a paper published June 1 in the “International Journal of Astrobiology,” said he doubted that intelligent aliens ever lived on Earth. Even if they did, he said, we’re unlikely to find their technosignatures because they’d likely have been destroyed long ago by erosion and Earth’s ever-shifting land masses. Similarly, it’s unlikely that technosignatures might yet exist on Venus, given its extreme heat and volcanic activity. But “the subsurface of Mars or the moon would be a good place for something to survive, say, billions of years, because there are no plate tectonics to destroy things there, and beneath the surface things would not be badly eroded by wind, dust, and meteorite impacts,” Wright said. If alien technosignatures do exist on Mars or the moon, it’s conceivable that we could use Earth- or space-based telescopes to detect them. Or it could take a little digging, by a future moon or Mars rover — or even an astronaut’s hands. Given the pace of space exploration, of course, these possibilities are decades away from realization. What do other experts make of Wright’s musings? – Should We Be Looking for Space Aliens a Bit Closer to Home? Dr. Avi Loeb, professor of astronomy at Harvard University, thinks it’s highly unlikely that Earth was once home to advanced beings other than humans. “First of all,” he said, “we don’t find any computer terminals in archaeological digs,” giving another example of a technosignature we might we might find in a dig if technologically advanced beings arose on Earth before us. But, Loeb said, “There could have been a visit by another alien civilization” from another solar system. The aliens might have visited us in person, he said, or via some form of space probe. If Wright is curious about what might lie below the surface of Mars and the moon, Loeb seems more interested the possibility that technosignatures could be found in space. Telescopes could be used to look for strange objects left behind by some advanced spacefaring civilization — for instance, a craft that might have been used to ferry beings or space probes our way. One way to mount this effort — what has been called the Search for Extraterrestrial Artifacts — would be via a sky survey. That’s a set of repeated telescopic viewings of the night sky that is often used to identify objects relatively close to Earth. Stars over Yushu county, in the mountains of Qinghai province as the Milkyway rises in the night sky. AFP/Getty Images / This Content Is Subject To Copyright. – Should We Be Looking for Space Aliens a Bit Closer to Home? Stars and galaxies remain fixed in these observations because they are so far away. Anything that changes its position from night to night is closer to us and thus likely to be an asteroid, dwarf planet, a spacecraft launched by NASA or another space agency — or, theoretically, an alien rocket abandoned long ago. “You’re looking for the needle in the haystack here, something unusual,” Loeb said. Sky surveys have been mounted by many organizations, including the Planetary Society and the SETI Institute. But most have been aimed at distant star systems. The few that have looked for objects in our own solar system are nearly 40 years old, and they came up empty.